Your bouldering equipment is incomplete without the right accessories. Some climbers might ask ‘What bouldering equipment?' Doesn't the thought of approaching the wall without heavy ropes, climbing harnesses, and quickdraws make you float right off the ground? In fact, boulderers need far less equipment in their backpacks than climbers However, a pair of sturdy approach shoes and some useful tools are things no boulderer would want to miss. Of course, apart from their bouldering shoes, boulderers need a wall and a crash pad in the first place. But the wall might have to be cleaned from dirt, dust, and weeds first. 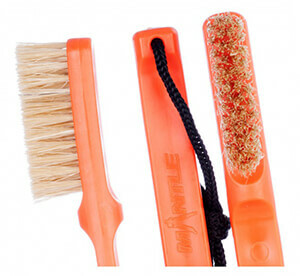 Therefore, boulderers must always have a boulder brush handy. Wataaah or Black Diamond provide boulderers with everything they need. Chalk, an indispensable climbing accessory, keeps boulderers from losing their grip. You decide whether you prefer liquid chalk, powdered chalk, or chalk balls. The advantage of bouldering bags is that they will stand independently without falling over like regular chalk bags. They also hold more chalk and you can use both hands to prepare for your bouldering session. Robust and widely cut bouldering pants allow you to move and climb freely. Designs by Black Diamond and other manufacturers are made of elastic cotton blends. They are very comfortable and stay in one piece until you're back on the ground. Stylish accessories like bouldering t-shirts, beanies, and hoodies make your bouldering outfit complete, even though they don't contribute to the technical value of your equipment.